NEW SNOW MONSTER LIGHT BULB BOTTLES NOW AVAILABLE AT ALL LOCATIONS! - EAT WITH HOP! Home / ANAHEIM / BOBA / CA / DRINK / HUNTINGTON BEACH / IRVINE / LA COUNTY / LONG BEACH / ORANGE COUNTY / WESTMINSTER / NEW SNOW MONSTER LIGHT BULB BOTTLES NOW AVAILABLE AT ALL LOCATIONS! NEW SNOW MONSTER LIGHT BULB BOTTLES NOW AVAILABLE AT ALL LOCATIONS! But! Snow Monster tends to set themselves apart from all the other competition by somehow making their bottles...better in a sense. Review below! This drink keeps going downhill for me. At first it was ehh. Second time it was super good! 3rd time (this time) it was such a strange color that looked so nasty I felt like I lost my appetite. very hard to hold. If you hold the top part (neck?) when the drink is still cold the condensation will make the bottle slippery and it might slip out of your hand. BE CAREFUL! I would say it's probably almost twice the size? because it's just so freakin big! That means you'll get more drink! When drinking, you have to take the lid off, because...there is no hole through the lid for the straw like the Squidies bottle. The bottle has the Snow Monster logo on it! It's not a sticker! Would probably be perfect to put some flowers in. Damn! Nice packaging is expensive! Here is a photo of the Squidies bottle (seen at the night markets) for comparison. Read my recap of the OC Night market here. Westminster: 9600 Bolsa Ave Suite G, Westminster, CA 92683. Huntington Beach: 17406 Beach Blvd, Huntington Beach, CA 92647. Irvine: 4255 Campus Drive Suite A124, Irvine, CA 92612. Long Beach: 5211 E 2nd Street, Long Beach, CA 90803. 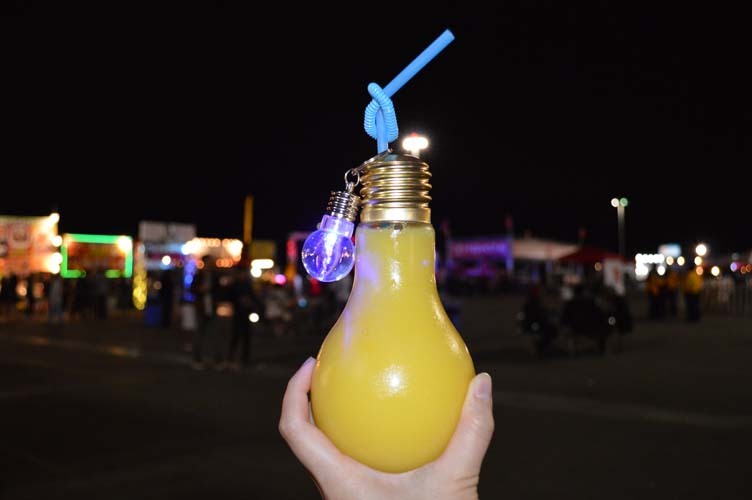 WHAT DO YOU THINK ABOUT THESE LIGHT BULB BOTTLES FROM SNOW MONSTER? WOULD YOU GET IT?